r o Sometimes, you track your project for a period of time and then a big change occurs. Maybe your company undergoes a major shift in priorities. 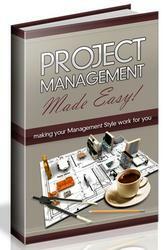 Maybe an emergency project comes up that takes you and your resources away from this project. Maybe funding was stalled and then started up again. In such cases, your original baseline might not be as useful a tool as it once was. And although you don't want to replace it entirely, you want to use another more up-to-date baseline for your everyday tracking requirements. Even if nothing catastrophic happened to your project, you might still have good uses for multiple baselines. In addition to taking that snapshot at the beginning of your execution phase, you might want to take another snapshot at the end of each month or each quarter. This snapshot can show more exact periods of time when you experienced greater variances between baseline and scheduled information. You can now save up to 11 different baselines. If you use earned value analyses, you can use one of 11 baselines for the earned value calculations. 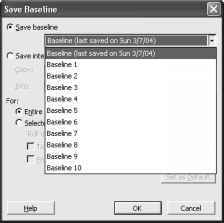 3 In the Save Baseline list, click Baseline 1, for example (see Figure 10-6). Figure 10-6. To save an additional baseline, choose any of the baselines in the list. the Field Name box, click the name of the additional baseline field you want to add to the table; for example, Baseline1 Duration or Baseline5 Start. The column and the contents of the field for each task are displayed in the table. Using the Multiple Baselines Gantt, you can view Gantt bars reflecting different baselines. Multiple Gantt bars for multiple baselines can give you a visual representation of schedule changes from one set of baseline information to another. Click View, More Views and then click Multiple Baselines Gantt. Each baseline is represented as a different color Gantt bar.